I finally got around to getting the toes of these socks grafted together. And I took a picture of them on my feet. My son, who is here visiting with us just saw me post this picture of my feet in their new socks, and he thinks it is very weird. When I told him that there are other people who also take pictures of their feet in new socks, he thought that was even weirder. He isn't a knitter, so he can't possibly understand. But, even if it is weird, they are warm and comfy, and just a bit slouchy around the ankles. But their first trip through the washer and dryer should fix that. And yes, I do machine wash and dry my hand knit socks. There is no hand washing by this girl. Sometimes, if I remember, I separate them out of the load of wash, and block them into shape and let them dry on their own, but mostly not. My UFO goal for this month was to get this leaders/enders project that has been on the waiting list to be finished for quite some time. When I drew up my UFO list at the beginning of the year, I decided that this one had aged enough, and was ready to be finished. It went from a bag of 4 patches and 16 patches to a finished flimsy. Now, it will move to the waiting to be quilted pile. I'm linking up to Finish it Friday and also to the Lovely Year of Finishes. The rest of today is going to be devoted to getting more quilting done on my Thanksgiving Leaves project. I'm hoping to have it done by the middle of next week. Snoodles, over at Lily Pad Quilting, is hosting a linky party for us to describe our treatment plans for Cabin Fever. The best way I have found for treatment, beside liberal doses of fabrics, preferably in bright springtime colours, is to plan and dream about this coming summer's camping trips. I browse through photos taken in past years, Like these following. These two were taken at Bon Echo Provincial Park. The one on the right is a picture of Mazinaw Rock, taken from the opposite side of Mazinaw Lake, And the one below is taken up close from in a canoe. I think this is one of the most beautiful places on earth, and one of my favourite places to go. Maybe we can spend some time here this summer. Then again there's Grundy Lake Provincial Park. This is one of the campsites there, right on the lake. I can easily imagine many hours spent sitting on this campsite, enjoying the quiet, and the sounds of the birds singing, and the wind in the trees. All it would need would be some needle work, or some knitting to go with it, or maybe a good book. Wouldn't it be fabulous to have a campfire going, in that pit right by the lake and listen to the loons calling and watch the stars as they come out to greet the night? There isn't a large city anywhere near this park, so the star gazing here is fabulous. Pinery Provincial Park is always a great place to go because it's only an hour from home. It has gorgeous beaches and dunes and tons of hiking trails, with lots of fun things to see. Best yet, the hiking trails are all through fairly dense forest, so the are cool places to go on hot summer days. Although, right now, in the middle of winter, I can't say that I am anxious for a cool place to be. Canisbay Lake in Algonquin Provincial Park is beautiful. Lots of the campgrounds in Algonquin are right off the highway, and there is a lot of road noise. But this one is several miles in from the road. It's a true get away from it all park, since there are no satellite signals available here. No internet, and no cell phone. But lots of peaceful lakes to get into for swims, or canoe trips. No motor boats allowed. There are even more hiking trails here than in the Pinery, although some of them are very long, and very challenging and a bit too much for this old lady's bones. And then there's Awenda Provincial Park. We spent a lot of time there last summer. It's about an hour away from where our grandson Avery lives. It gives us lots of time to go and visit him, or they come out to the campsite and visit us. Looking at all these pictures always leaves me feeling that there is hope for the spring and summer to get here, eventually. But, lots of times I want to see what else is out there. I'm starting to sound like an official tourist site for the parks system here, but really, I'm not. But the web site for our Provincial parks has a really neat feature for some of the parks. If I want to check out someplace we haven't been yet, I can go to the site for that particular park, and find maps of the campgrounds. And even better, most of them have pictures of the campsites. Oh the hours I can spend going from campground to campground, imagining setting up on different sites, and it's still the dead of winter, but in my imagination, I'm on one of those campsites and, in my imagination at least, it's summer. I'm going to go on over to Lily Pad Quilting and see what other treatment plans are available for this Cabin Fever illness. I don't have anything new on my wall today. I'm working on the quilting on Thanksgiving Leaves. This is a really bossy and fussy quilt. I had a plan for what I wanted to do on it, but it turns out that what I planned is not what it wanted. So I spent a large part of today drawing on the quilting design that I wanted, stitching part of that quilting design and then ripping out that quilting design. It took a while, but we've come to an agreement, this quilt and I, about what is going where. We both agreed all along that there would be continuous curves in the pieced leaves. Today we came to the agreement that there would be vines and tendrils in the large open areas, as well in the narrow outer border. Now that we've come to this accommodation, the quilting will go much faster, I hope. 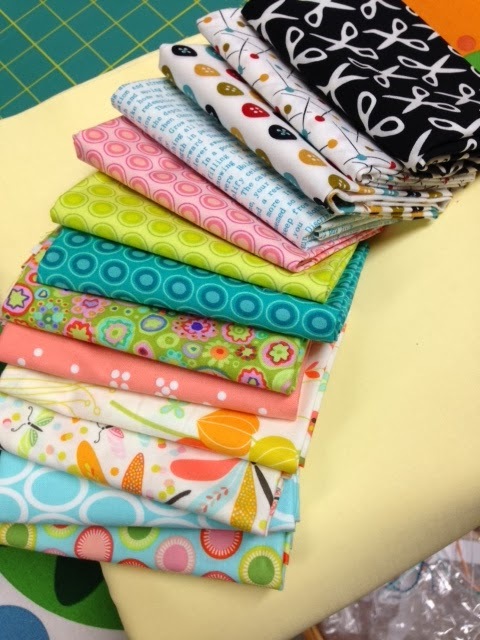 These wonderful fabrics were added to my stash this week, the first addition this year. There are 8 yards of Kona Maize, and then 13 really fun fat quarters. I had hand to hand delivery service for these. Gail went to Ottawa this past week, and stopped in at Mad About Patchwork, with instructions from me to pick up, in addition to the pale yellow that I ordered, some fabrics that were "outside my box". She did good. They are outside my usual choices, but I love them. They will be fun to make up into something, as yet undecided. I've had a very productive sewing week. My 2 1/2 inch leaders/enders project, which was February's UFO, is now finished, and I got a backing made for Thanksgiving Leaves, which had been loaded onto the quilting machine. So, in spite of the additions this week, I remain in positive stash used numbers. We had a really fun sew-in day for the guild yesterday, which is when I put the last seams into this month's UFO. Each time I go to one of these I enjoy myself more. I'm getting to know more of the ladies, and feeling much more comfortable in the groups. I am a solitary quilter no longer, and it feels wonderful. I'm linking up to Judy's Stash Report. Every now and then I get a quilt to do that is just pure fun. All of the quilts that come my way are lovely, and I enjoy all of them. But this one was just pure fun. This quilt is Christine's It's a Scrappy Trip Around the World, a pattern found on Bonnie Hunter's website. The fabrics are so bright and happy, with a Hallowe'en theme. This is a close up of the border area. 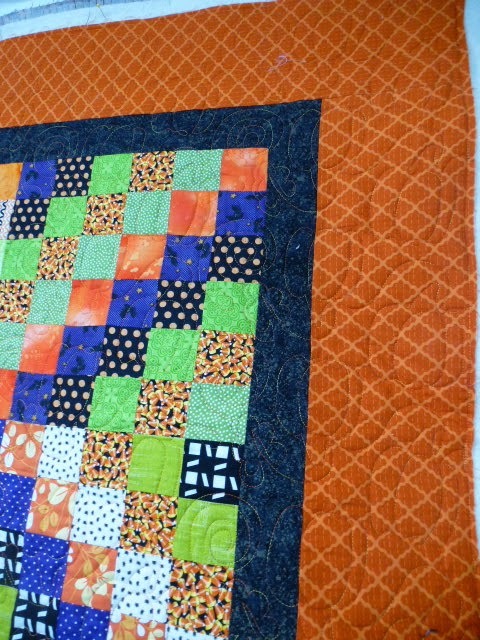 It shows the quilting Christine chose, which is called My Pumpkin Patch. The biggest reason for the fun in this quilt was the fabrics. Haunted houses and candy corn and owls in this batch. More owls, some skulls and some funny witches in this group. And in this group there are some bats, some spider webs, some little ghosts and some googly eyes. Have I mentioned lately that I love my job? Life is good. As planned from yesterday, after pulling this very old UFO from the plastic bin, I put it up on the wall today. I needed to remind myself how it went together, and how much is left to do on it. This was a four part pattern from Quilters' Newsletter, starting in November 2003. It's called "A Few Compasses Between Friends". This is an example of a love at first sight quilt that got worked on intensively for a couple of years, and then got replaced and set aside. Yes, I'm fickle when it comes to my quilt loves. It started out as a variation on the quilt as you go technique, where I started quilting the center panel and planned on then quilting the large side triangle areas, and then joining them with the two long diagonal sets of sashes. I think I stopped working on this because I became unconvinced that doing it this way would work, but couldn't figure out how to salvage it. The center diagonal section is almost finished hand quilting. 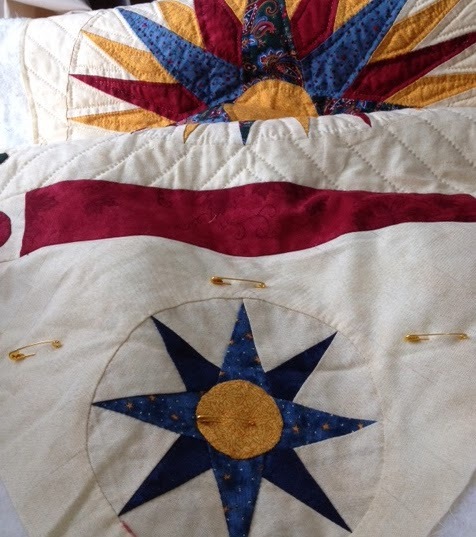 There are just the end triangle compass sections to finish the hand quilting on, and I got about a quarter of one of those done yesterday, during my Sunday hand stitching. I think once I'm done that, I'm going to finish piecing the rest of it, and then assemble it into a whole and finish quilting it that way. I can't remember right now why I even decided to quilt it in sections. It would have made sense to do it this way if it was being machine quilted on my domestic, but the reasoning for hand quilting it this way has me stumped. And that's pretty bad, because I'm the one that decided to do it this way. But, then again, it was over 10 years ago. I have to get into the boxes that have my old patterns in them, and find this one. I know I went through all my old magazines before we moved, and tore this one out and put it into a binder. Just need to find the binder. I need to know the finished sizes of these blocks before I can assemble it. It is still going to take some staring at it, in order to figure out how to finish it. I have to add the backing to both sides of the center panel that is already done, and then add in the batting, probably whip stitch it together so there aren't any bumpy areas. I'll probably have to hand stitch the length of the red sashes all the way down the length of the center section in order to attach the side triangles. I don't want machine stitching to show up on the back as if it were quilting. In the meantime, I'm linking up to Judy's Design Wall Monday. and then plan onwatching the olympics and knitting on some socks. I've switched up what I'm stitching. I've had enough of My Tweets for the moment. I think I'll put it away until the summer, when it can become my enjoy the outdoors project. So I pulled out an ancient UFO that's been on my mind ever since I found it while getting organized for moving last year. And I've come across it a few times since moving here, and each time I've thought that I should get it out and maybe try to finish it.The final incentive to haul this out was Kathy saying that the quilt she is working on is seven years old. She asked if we could beat that. This one dates back to 2003. It's a pattern from the Quilters' Newsletter magazine that was given in four parts, starting in Nov. 2003. I only know that because I had to do a search online to find out. It's called A Few Compasses Among Friends. I do have the pattern from the magazine in a binder around here somewhere in a box. I'm going to have to find it before I can finish this. 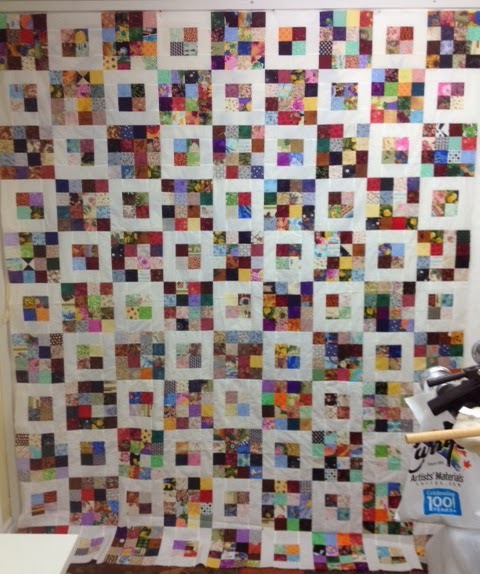 Most of this quilt has been hand pieced, and I was hand quilting it. 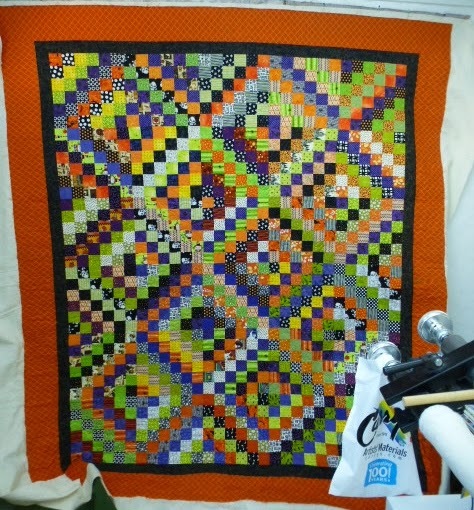 I think I got stalled on it because I was doing a modifies quilt as you go, but couldn't figure out how to actually put it together after I got the sections quilted. I think I know how to do that now. I haven't done any hand quilting since this one got packed away, so it's going to take some time to get the callus on my finger built up. But the actual mechanics of the stitching came back as if it was second nature, and the stitches from 10 years ago don't look much different than the ones I've put in today. I'd forgotten how soothing the rhythm of hand quilting is. I'm sitting in my comfy recliner chair, quilting and enjoying the view out the window beside me. 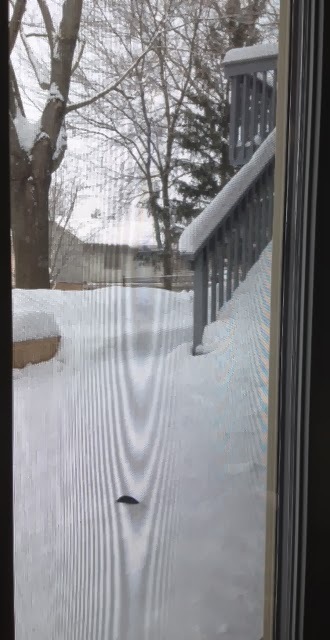 That weird shape in the picture is the screen. It's frozen in place, so I couldn't move it out of the way to take the picture. 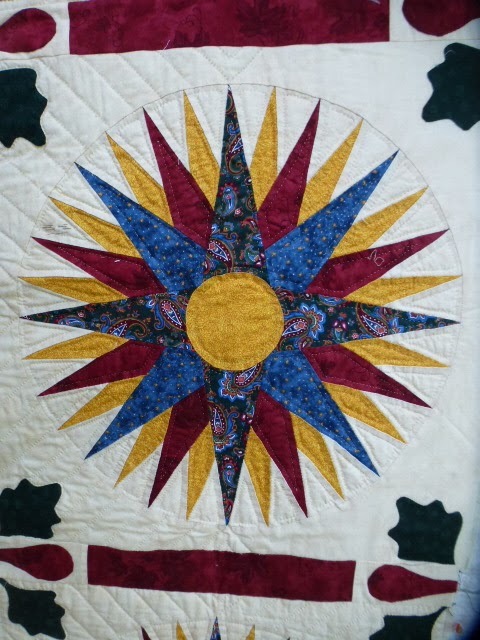 Our guild is having its quilt show in October. I think it would be kinda neat if I could have this done by then and enter it. So, I'll set that as a loose sort of goal. I'll try and get the rest of the components of this quilt sorted out, and get it up on the design wall by tomorrow. As far as stash report goes, there is more out from the pinwheel blocks, and from the whites cut for my February UFO project. Balance: 16.1 more yards out than in. Those 0 yards numbers will be changing this week. Gail went on a road trip this weekend, and made a stop at Mad About Patchwork, which is actually an online store, but Pam will occasionally let people "shop her basement" as she calls it. So Gail had a shopping list from a few of us. I had a Kona cotton solid that I wanted, and then told Gail to pick out some stuff for me that is outside my usual box. It will be fun to see what she comes home with. I'm linking up to Kathy's Slow Sunday Stitching and Judy's Stash Report. After I finish here, I'm going to go mix up some bread. While it is rising and baking, I'll go back to more hand quilting. 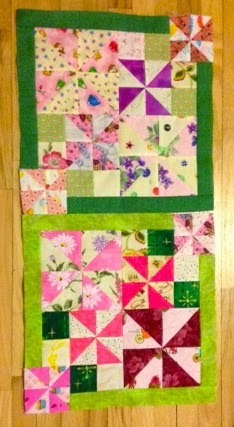 I spent part of yesterday, and then this evening working on my Rainbow scrap challenge pink pinwheel blocks. I decided to do both of them at the same time, rather than one this week and another next weekend. There's a sew-in day for the guild next Saturday, and I didn't want to spend it doing one of these. So, my pinks are done for the month. I'm having a hard time believing that February is half over already, more than half, really. I've done very little with my UFO for the month, which is the other reason I wanted to get these done. Now I can focus on working on that. 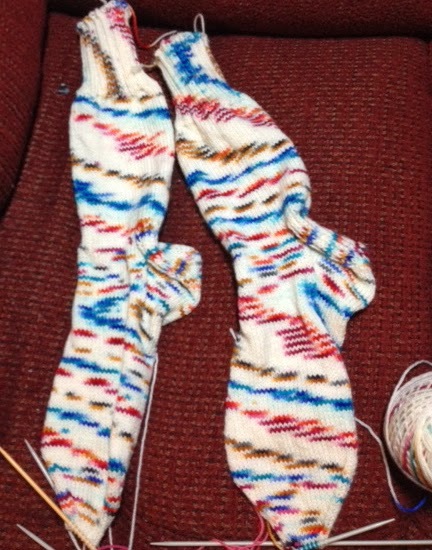 I finished up the Manos Del Uruguay socks, except for grafting up the toes. That takes some time and concentration, and with watching the Olympics, especially the figure skating, (Canada's men got silver, yay Canada), when I don't want to take my eyes of the screen for more than a second for risk of missing something, I haven't taken the time to graft those toes. I did, however, start a new pair of socks, since I can do the basic knitting without looking at it, or at least not much. These new ones are a Berroco Sox brand. I love the way these are striping out. I have the heel flap done, and the heel turned, and am ready to pick up the stitches for the gusset. There might be more of these type socks, in different colours, in my future. For that matter, there will probably be more of the Monos del Uruguay yarn in my future too. I think I'm going to finish up these socks, and then restart my Pinery sweater. I'm linking up to Judy's On the Needles. I have really badly fallen behind in posting about all the customer quilts I've been doing since the beginning of the year. I'm going to try and correct that in the next couple of weeks. Then I'm going to try really hard to post them as they are done. So, here are a couple of wall hangings that I did up for Charlene. This first one is an Edyta Sitar design, using her pre cut applique shapes. The applique shapes were all stitched in the ditch, and the background was quilted with a swirling design to give the feel of blowing winds. The other one of Charlene's was a small halloween wall hanging. There are actually two of these, but I'm only showing one, since they are both the same. I did a simple pumpkin pantograph on them. The centers of these log cabin blocks are so cute! I've put Three of a Kind back up on the wall. I have a few of the border units pieced now. 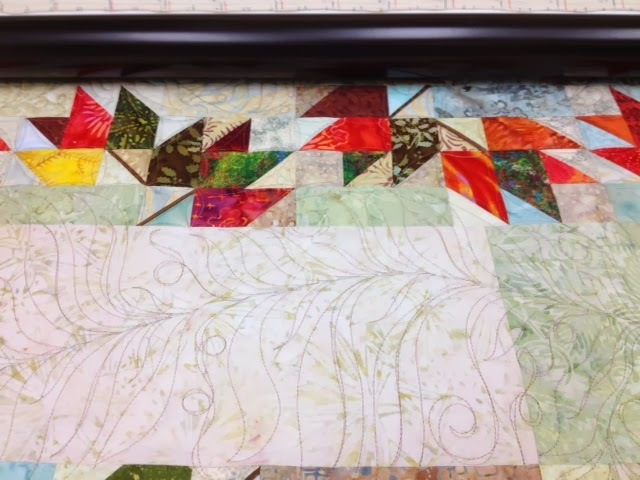 I'm using components of the blocks as leaders and enders for the piecing here, and when they run out, I use the border units, so that I'm constantly using something in this quilt as the start and stop process, rather than constantly clipping long threads. The blocks also go together much faster this way. Twenty four blocks done, twelve more to go. Then I can begin the process of putting this one together. The more I see of it, the more I like it. In the final product, there is a 6 inch border of the Kona Ash in between the body of the quilt and the border blocks. They all eventually look like they are floating. I'm linking up to Judy's Design Wall Monday, and then I think there might be some knitting for the rest of the evening. Today has been more of an unstitching day, than a stitching one. I had some tension issues while working on a quilt on Friday. So, a whole section had to come out. Most of the afternoon today was spent doing that. The only bonus about tension issues is that it makes taking the stitching out easier. (sigh) But it's done, and the quilt is reloaded and ready to go again for tomorrow's work time. I have done a little hand stitching, just to relax after all that ripping. It's still My Tweets, and the block doesn't look any different than the last time, but all the stitching is done, except for a section of the dark blue wing. Next time you see this block it will have some leaves, and maybe the flowers added to it. 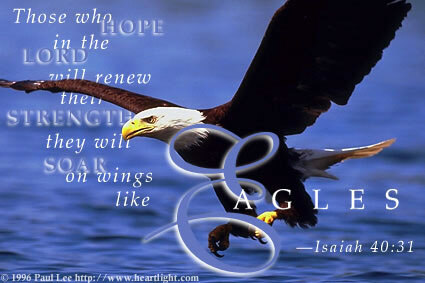 As I was quietly sitting and working on this bird, I happened to look up and outside the window beside me. I was struck by the beauty out in the yard in the late afternoon. The skies had cleared from the snow we got earlier today, to blue with fluffy white clouds. Not a bright blue, but a pale winter blue. The greys of the branches of the bare trees, and the greens of the pine trees, laden with fresh snow on their branches provided a perfect contrast against the background of snow and sky. It reminded me that even winter can be beautiful. If I hadn't had the motivation of working on this block today, I would have missed the beauty. The stash usage continues to go up. I think I'm liking adding the stash used numbers as I actually make the units of a quilt. It gives me immediate reward numbers. Being the procrastinator that I am, I'd have a long wait to add in my used numbers if I waited until a project is done. Balance: 14.3 more yards out than in. I'm linking up to Judy's Stash Report and Kathy's Slow Sunday Stitching. I had a lovely afternoon today. A group of four of us got together at Gail's, aka The Cozy Quilter, for a sewing afternoon. I spent the afternoon playing with my pinks. I did up all the pink bow ties that I had prepared, and also finished the last four of the triple four patch blocks. which means I'm on schedule for all the blocks I want to do for this years ScrapHappy Saturday challenge. There are lots of other really fun projects showing up on the SoScrappy blog. So many good ideas, so little time, and I want to do them all. I've got a pair of socks on the needles right now. The same ones I started last week, but they've grown considerably. This is a yarn from Manos Del Uruguay. I think the brand name, or sub group name is Alegria, and the colour is Columbina. I really like the way the colours are curling around the socks. These are my watching TV during the olympics project. 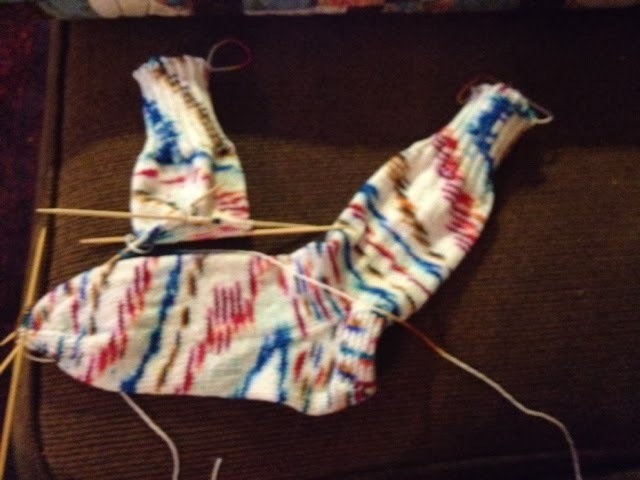 I can do them without thinking, except for turning the heel, and I can more or less fell my way when knitting them, so I can watch the TV as much as looking at the knitting needles. When I get to finishing the toes, I'll have to break out the how to do Kitchener stitch youtube video again, since I still haven't got it fixed in my head how to do it yet. I'm going to Gail's for a sewing afternoon tomorrow, and am planning on stopping off at a yarn shop there to see if I can pick up another hank or two of the yarn for my Pinery sweater. One of the things I learned before I ripped it out was that I had enough to do the sleeves when the sweater was too small, but if I do it in the right size, I might not have enough yarn. There's a store in St Thomas called The Little Red Mitten, which is where I got this sock yarn, and I noticed they had the yarn I was using for the sweater. Hopefully they still have some. Then I'll feel confident about starting that project over again. I'm linking up to Judy's On the Needles. I put up this month's UFO on the wall today, just to see what I've got, and what needs to be done. I don't have enough of any one colour to do the 2 1/2 inch borders around the 4 patches, unless I do white, and I'd rather keep my whites for other projects. I'm thinking of a couple of light greys, at the moment, but that could change, once I actually see it up there. I like the way it looks now, with the light areas of the wall showing through, so I'll try and keep that as much as possible, without buying more fabric. The other thing I just though that I could do would be to check out the very large tub of leftover muslins that I have buried under the stairs. Hmmmmm, that might be the way to go. Finish a quilt, and empty a tub of fabric, or at least get a start on emptying it. I think I'll post this, and link up to Judy's Design Wall Monday, and then go check out exactly what is in that tub of fabric. I didn't do a whole lot of sewing this past week, or at least not as much as I usually do. No energy to do much beyond the basics, these days. And it continues. I was up until after 3 am, before I finally fell asleep this morning, and woke at 10 am, and it wasn't solid sleep up until then. I have a sleep disorder that kicks up every now and then. I won't be doing any hand stitching today, since I don't seem to be able to concentrate. I'll do a little more on my pink scrappy blocks for the Rainbow scrap challenge, and maybe one or two Three of a Kind blocks. They don't require a lot of thought. But, on the other hand, I may just sit and knit and watch movies. Balance: 12.4 more yards out than in. I have all kinds of pieces prepped for sewing up more Three of a Kinds, and also the scrappy triple four patches. I can add them as used as soon as I get them sewn. I'm linking up to Judy's Stash Report and also to the goal setting link box for the February goal setting party for the Lovely Year of finishes. February's colour is pink. I'm a day behind in getting to these. I haven't been feeling that great, and sleeping at night is a distant memory, so yesterday was spent on the couch with sock knitting. Today's a bit better, but still not great. But anyway, I got some of my pinks selected and cut out to make my triple four patch units. Four are sewn together and the parts for the last four are ready to go. I've discovered that I don't have a lot of the darker pinks that would work with this block, and have enough contrast to allow the beige diagonal line of squares to show up. It was a struggle to come up with eight on them. The last four of these might end up getting set aside to be worked on next weekend. I'm linking up to SoScrappy. There's lots of other fun pink stuff to see over there.